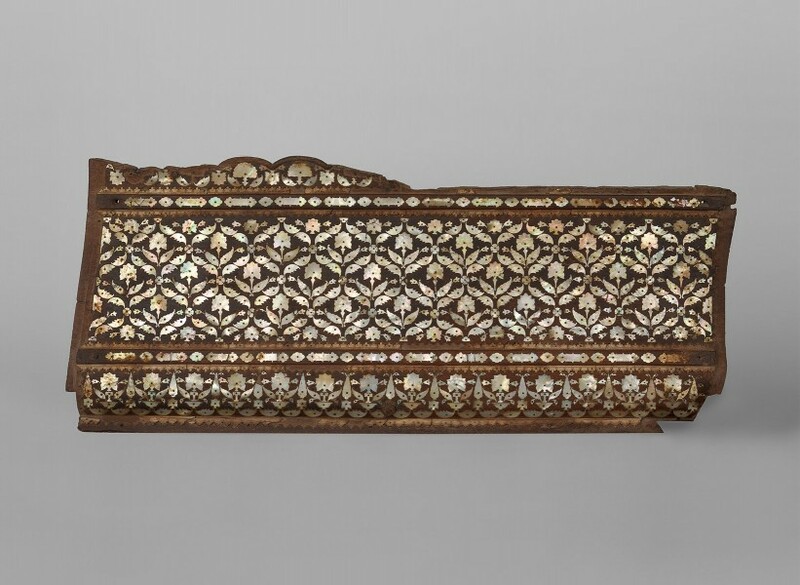 The present mother-of-pearl panel was once part of a howdah, the seating arrangement that in India is usually carried on the back of elephants. The mother-of-pearl inlays create an intricate pattern of flowers, surrounded by a profusion of serrated leaves. The woodwork creates bands with ornamental incisions, as well as an arched outline on the top of the panel. Combining mother-of-pearl with the darkness of the wood creates an elegant and lustrous effect of radiating multi-coloured shine, a sign of luxury and wealth that would be associated with the nobleperson sitting on the howdah. Gujarat, in the Northwest coast of India, was an important and prosperous region that came to prominence during the Mughal Empire. Its ports became busy centres of export, leading the Portuguese, Dutch, French and English to settle bases in the region in the 17th century. It was also a prolific centre of mother-of-pearl workshops, which created the finest of luxury goods in the sumptuous material. Mother-of-pearl wares were particularly favoured in the Mughal courts, as noted by Sir Thomas Roe, who in 1616 mentioned a throne and a pavilion covered in this elaborate technique near Agra at the Emperor’s camp (The Embassy of Sir Thomas Roe to the Court of the Great Mughal, Vol. II, pp. 325-26). These artefacts were produced for the Indian market as well as for various export markets, from Ottoman Turkey and the Middle East to several European countries, including a particular interest by the Portuguese.